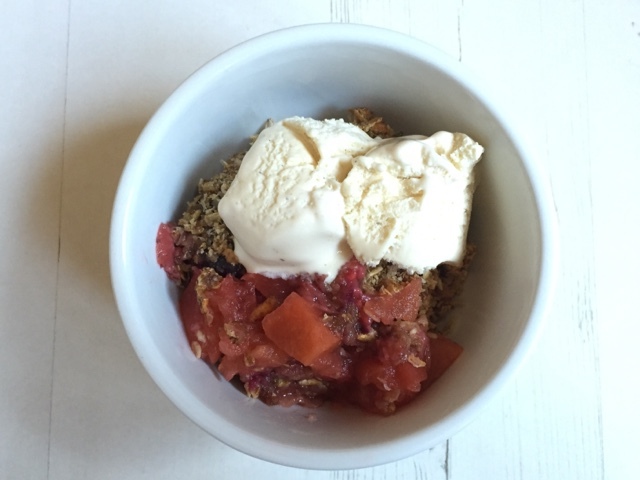 Hijacked By Twins: Apple and Berries Crumble Plus Degustabox Contents and Discount Code! Apple and Berries Crumble Plus Degustabox Contents and Discount Code! Last month I received another delicious Degustabox. 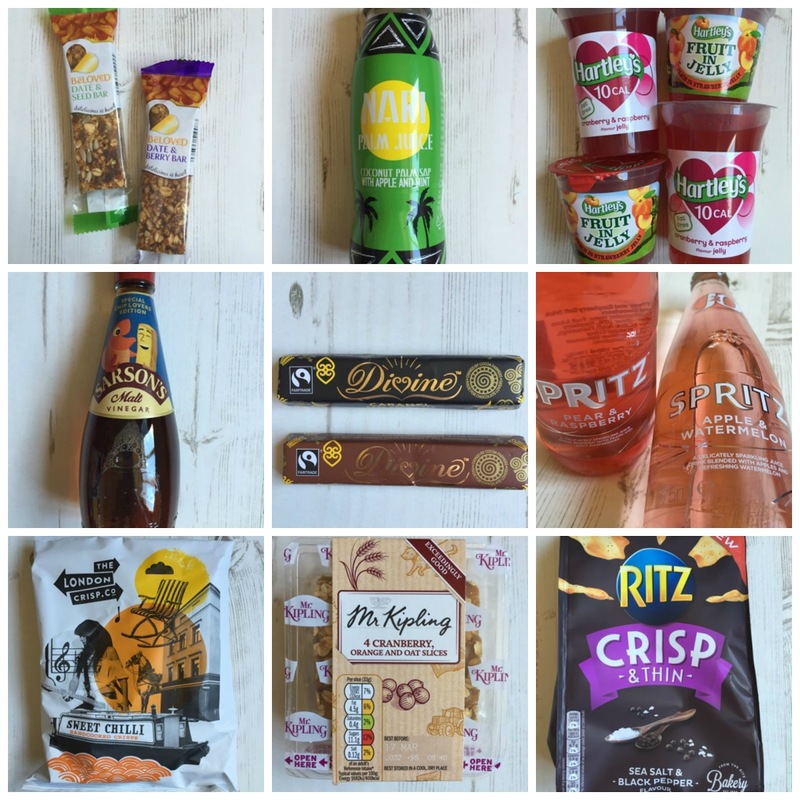 In last months box there were some really exciting products, a few of which have become a yummy addition to my shopping list! Degustabox is a monthly subscription service where each month you receive a box full of foodie treats. Many of the products that you will receive are new to the market. That is what I love most about Degustabox, the chance to find new products. I find that each month there is something for everyone in the family which is another huge selling point. Beloved Dates - These wholesome bars and 100% natural made with no added sugar and are the only cereal bars that have been bound using natural date nectar. These are delicious treats and perfect for a mid afternoon snack. Nari Juice - This juice is made from coconut palm sap and infused with 100% natural fruits and spices. They come in two flavours, Lemon and Ginger and the one I received Apple and Mint. Hartley's Jelly - These are a favourite of mine as they allow me to have something sweet without too many calories! Sarsons - Sarsons is not a new product but they are releasing the limited edition bottles like the one pictured above. Sarsons Malt Vinegar is a firm favourite in our house for fish and chips! Divine Chocolate - I will admit that I did not have chance to use these in a recipe as they were perfect on their own! If you are looking for a divine chocolate look no further! J20 Spritz - I love the regular J20 drinks so I was excited to try their new drinks. They are so refreshing. They come in three new flavours and contain only 63 calories! The London Crisp Company - Crisps are one of my food weaknesses. I love crisps and was not disappointed with The London Crisp Company's hand cooked crisps. Mr Kipling - My children love Mr Kipling cakes, especially my eldest. They make a handy, sweet addition to his lunch box. These oaty cakes contain wholesome ingredients like fruit, coconut and oats. Yummy! Ritz Crisp and Thin - These are a new oven baked potato snack. They are great as they are or great to use with dips. Now on to my favourite product Nutribix. 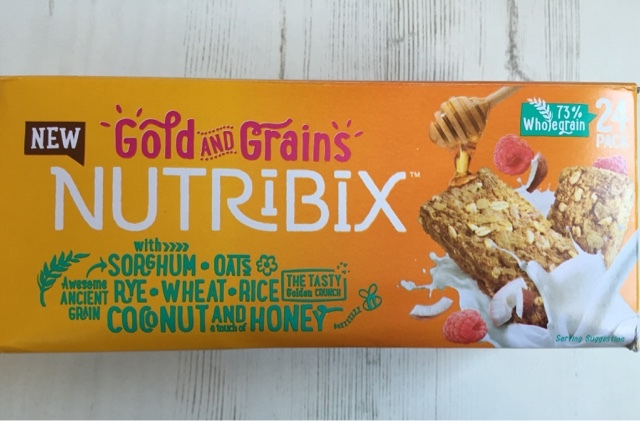 Nutribix is a wholegrain cereal made using coconut, honey and an ancient grain, sorghum. These are the perfect way to start the day. As I loved this product so much I decided to use it in my recipe. My recipe is not a breakfast one. I wanted to show you how versatile this product is and have used it as a crumble topping. This pudding is perfect served with a good scoop of vanilla ice cream. 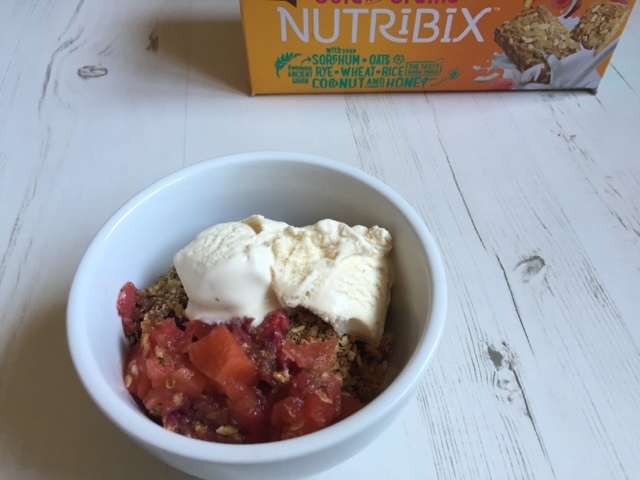 I love how the Nutribix adds extra flavours to the crumble topping. 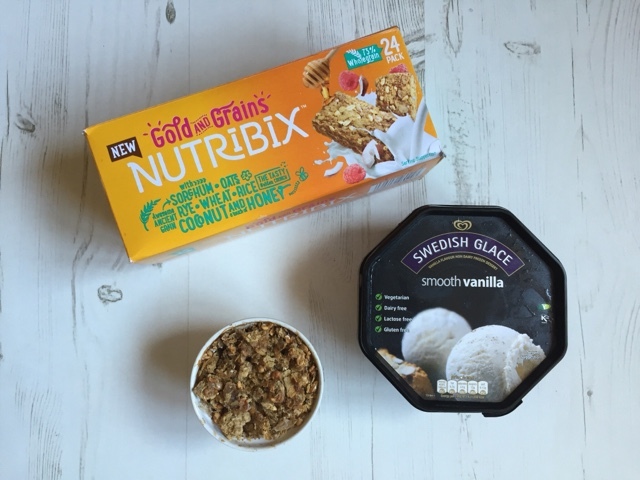 If you are looking for a breakfast cereal that can be used for more than just a breakfast try Nutribix! If you would like to try Degustabox for yourself I am delighted to be able to give you this special money off promotion code. Simply add BLDEG15 when you check out to receive a £6.00 discount on your box! Disclosure: I received the Degustabox for the purpose of this post. No cash payment was received.